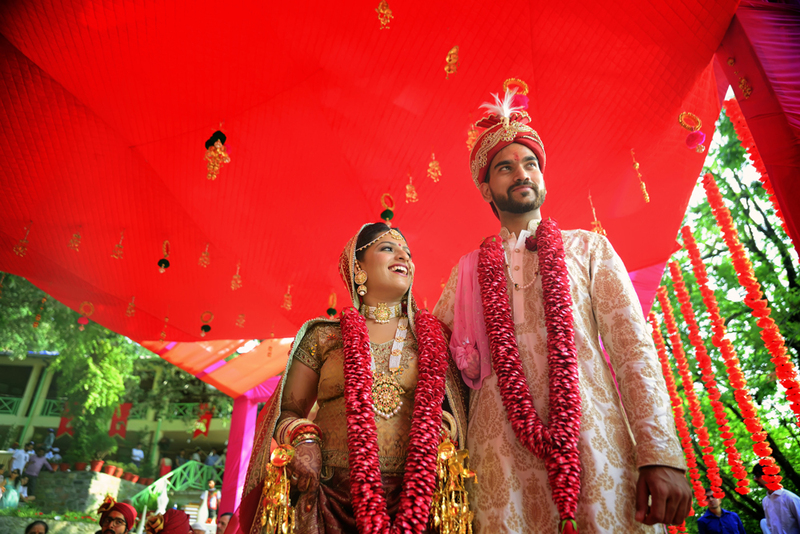 Prashant and Sukriti dated each other for 7 years before getting engaged. Prashant is a pilot and Sukriti works with a corporate as an HR. “When the world is about to come to its end, I’ll have my pilot to fly me away” says Sukriti. Together, in so many years we have seen a lot of ups and down and struggles, we have also celebrated each other’s success, we have cried, fought, loved and laughed together. We found perfection in our little imperfections. Together we complete each other. On 26th October 2014, On the Bombay Sea Link, along with our closest friends, Prashant told me to get out on the sea link and light a sparkle, while I was doing it, he went down on his knees and said to me “Complete my life and marry me”. It was the most overwhelming experience of my life. The most beautiful hug, one of the happiest moment of our lives. Our families met, started deciding the details about marriage, we were asked where do you want get married, we said Kasol, everyone laughed and we moved on. We were asked to see all the venues in and around Delhi, every Sunday we went to see these venues, everything we saw and heard was exactly what we did not want to do. On Christmas evening Prashant and I left for Naukuchiatal, as a break from the wedding frenzy. The night we reached Naukuchiatal, we met an amazing couple Kunal and Sonia (They own this cute little stay called the Lake Village), they inspired us to do what we love, celebrate our love and not just get married . The following morning we woke up and the decision had been made we were in love and we were in love with Naukuchiatal, we so had to get married there. We came back told our parents, they were extremely apprehensive, wedding planners refused to do a wedding in Naukuchiatal, saying its impossible, then we had Bhramatattva, who promised us our dream wedding. And finally we had a dream wedding! After throwing a lot of tantrums we got to celebrate our love. Our aim was to make our wedding as eco friendly as we could, we got our cards made out of Jute, our return gifts were all herbal products made in the hills, local flowers were used for decoration. It was a simple yet an amazing wedding. The Baraat came on the boat across the Naukuchiatal Lake, the Varmala happened on a boat decorated for us. Our Pheras happened with the lake as a backdrop. For everybody who worked with us to give us our dream wedding, we definitely made their lives hell – as we were very stubborn, we didn’t let our photographer do a “shoot shoot” for us, we were finicky about the kind of film we wanted, the songs. There were back to back functions, and my make up artist was so patient with me being cranky and crazy. We gave everyone a hard time, but when we saw the photobook and the wedding film, we feel it was all just worth it!! Special thanks to our parents for tolerating our nonsense and supporting us and letting us do this!